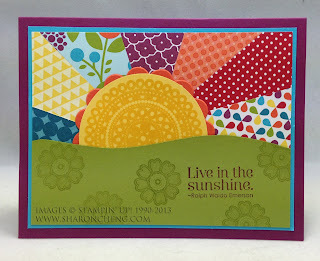 I got the inspiration for this Sunshine and Happy Days card from a post on Operation Write Home. There is a tutorial for making this style of card called a starburst. Because this card ended up being fairly quick and easy to make, I used it for a swap card at Stampin' Up! 's Leadership 2013 Conference in Orlando, Florida. While it looks complicated, using the Big Shot and circle punch made the sun go very quickly. Following the instructions on the OWH tutorial made the rest of the card much easier than I had thought it would be. For this card, the starburst is built on a piece of paper that is 5 x 3 3/4". The mat is 5 1/8 x 3 7/8 in. If you've been following me for a while, you know that I like thin mats! It's a style that I picked up from a folk art painting instructor. She likes to add a thin mat to pull your eye toward the design. For the grass, I cut a piece of Lucky Limeade card stock 2 x 5 and free hand cut the top edge. The top edge is lightly sponged. I have a close friend who has been ill and I wanted to make her a special card. While I wanted her to know I was thinking of her, I did not want the usual get well sentiment. I decided on this card because it reminds me of a quilt. She likes quilting and papercrafting. The Summer Smooches Designer Series paper is so bright and colorful that it helped make a cheerful card. I have used this for other projects including a just for you card and birthday card.